June 15 & 16, 22 & 23, 29 & 30 July 6 & 7, 20 & 21, 27 & 28 August 3 & 4, 17 & 18, 24 & 25 Free! Created by artists to support the arts. Created for artists and supporters of the arts. VIA Noke Magazine is the brainchild of graphic designers Emily Sibitzky and Chelsea Brandt, both graduates of Radford University’s graphic design program with Bachelor of Fine Arts degrees. Emily and Chelsea are co-owners and founders of Desired Hype Design LLC established in February 2012.
cation design and the arts. Although we recognize the advantages of modern technology, we passionately believe that the impact of print media is too valuable to become obsolete. Art” and also refers to how we want to be a source of information and communication between members of the creative community and those who are searching for avenues in which to become more involved. “Noke” is a slang nickname for our beloved city and is commonly used among the millennial generation throughout the region. 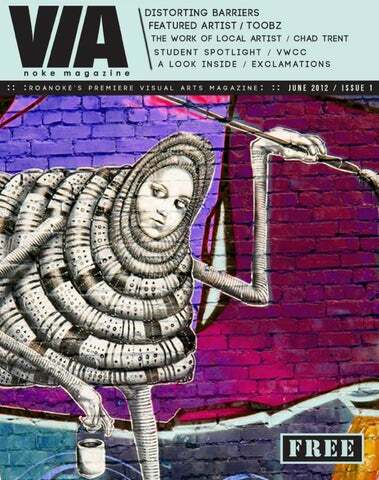 In essence, we aspire to be a designated source for discovering visual art in Roanoke through this medium. By bringing VIA Noke to life we are putting the arts directly into peoples’ hands, giving them a new opportunity to connect with the creative community that surrounds them. Our goal is to provide a designated source to open up communication between different types of artists so they can learn more about one another and hopefully begin collaborating. EACH ISSUE will feature local artists, ranging from high school and college students all the way up to professional working artists. We want VIA Noke to serve as a voice for the artists and a way for the community to get to know them. To share the artists’ ideas, processes, and inspiration is our main goal. Readers should close the last page with more knowledge about the art community surrounding them and hopefully have the urge to either become a part of it or support it like never before. COVER PHOTO: Manipulation of a photo taken by Patty Quilter. Mural by Toobz in alley beside Wilson Hughes Gallery on Campbell Avenue. JUNE THERE IS NO EXCUSE FOR SAYING “THERE’S NOTHING TO DO AROUND HERE.” WITH LIVE MUSIC EVERY WEEK AND FESTIVALS AROUND EVERY CORNER, JUNE IS SURE TO ENTERTAIN. (Top to bottom) DJ Harvest Blaque (Bryan Hancock), photo by John Park; Chelsea Brandt and Emily Sibitzky, photo by Patty Quilter; Jeanie Patterson (Owner of the Daily Grind), photo by John Park; Lousie Wade (Miss Virginia Senior 2011), photo by John Park. Pecha Kucha logo (left) used with permission of Klein Dytham. the first night, it wouldn’t have been able to happen. It was a group effort, which is the whole idea behind PechaKucha, I think.” Thankfully, David no longer has to run the show alone. “I now have a growing team of incredibly motivated and talented individuals who believe in PechaKucha’s mission.” A variety of topics were presented at the first and second PechaKucha Nights, both of which took place in downtown Roanoke. Presenters ranged from Erica Mason of Hired Guns discussing “20 Steps to Creative Success” to 13-year-old Jacob Wynn excitedly explaining the rules and terrain of Christiansburg’s Wolf’s Ridge Paintball. In fact, the diversity in subject matter is what makes each PKN so great. “Good PechaKucha presentations are the ones that uncover the unexpected, unexpected talent, unexpected ideas,” the website reads. “Some PechaKuchas tell great stories about a project or a trip. Some are incredibly personal, some are incredibly funny, but all are very different making each PechaKucha Night like ‘a box of chocolates’.” David’s mission for the Southwest Virginia chapter of PK is clear: “I want PechaKucha to become the first thing people think of when it comes to where to find out what incredible things people are doing and things happening in our area. PechaKucha belongs to each town and city in SWVA, each presenter past present or future, every sponsor, every person who attends, and people who don’t know about it yet. If people take ownership for PechaKucha, in turn I hope they will take ownership of the community they live in and its neighboring communities. Ownership is how communities grow and flourish.” PechaKucha Night #3 is tentatively set for Wednesday, July 18 and will take place in Blacksburg or Christiansburg. Visit pechakucharoanoke.blogspot.com to keep up with the local chapter and to learn details as they become available. PKSWVA can also be found on Facebook. Visit http://www.pecha-kucha.org/ to learn more about PechaKucha. Jordan Poole SCHOOL : VIRGINIA WESTERN MAJOR : COMMUNICATION DESIGN Jordan Poole has been as artist as long as he can remember. His work ranges from still life studies and portraiture to conceptual pieces inspired by social issues. His choices of medium are just as varied. “I have no single medium that I prefer to work with. I believe it is important to understand art as multifaceted and through a variety of study and mediums I can enhance that understanding.” “I am inspired by nearly every movement in art and each new view. I have recently become inspired by Joyce Faulknor, and Jesi Pace Berkley, and I will always find inspiration in the works of Jackson Pollock and my father David Poole. My inspiration is ever differing. I will see something that will spark a train of thought and usually my art will be its conclusion, and each is significantly different, but occasionally I will continue to produce from a single thought.” Jordan also finds inspiration in music. “I think that art and music share similar aesthetic qualities in beauty and the way they deliver messages. I believe I am motivated by music and art similarly.” After his time at Western, Jordan plans to attend the Douglas Education Center for Tom Savini’s Special Makeup Effects program. His dream is to work as a prosthetic makeup artist for the film industry creating special makeup effects. Additionally, he says he plans to continue his fine art exploration. “I am always willing to sell any of my artwork to someone who appreciates it, along with accepting commissions for beautiful new endeavors.” Left: “Star Man,” watercolor and guache. Right, top to bottom: “Green Pitcher,” oil on canvas; “Jimi,” watercolor; “Orage Still Life,” oil on canvas. Samantha Macher Samantha Macher’s play To the New Girl from the Former Mrs. ___: Sound Advice to My Husband’s New Wife or Mistress is coming to Studio Roanoke this month. We contacted Samantha to get to know her a bit and to find out what inspires her work as a playwriter. Summarize To the New Girl for someone who knows nothing about it yet. “To the New Girl” is a ten-woman monologue show in which women in relationships give advice on the proper care and feeding of their former spouse to their mistresses. Tell us a little about yourself. Where are you from? Where did you attend college and what did you study there? How did you get into professional play writing? I have always been a writer of sorts. As a kid I would write short stories and turn them into books, and as I got older I would write poems and songs, and eventually, I started writing plays because I really enjoyed writing dialogue. I got into professional playwriting because I always felt like I had a story to tell, and in my opinion, there’s no better way to really reach the audience for it then through live theater. There’s nothing like it in the world! I’m so glad I got the opportunity to be a part of the Playwright’s Lab at Hollins University to hone my craft, and give me the contacts I needed to go be a playwright in the real world. How many plays have you written and how many of them have been performed on stage? I have written seven full-length plays and probably between fifteen and twenty completed ten-minute to one-act plays. I have had the great honor of having four of my full-length plays performed in theaters across the country, namely SkyPilot Theatre in Los Angeles, Hell-Tro Theatre collective in Brooklyn, and at Mill Mountain Theater in Roanoke and Playwrights Horizons 440 Studios in Manhattan in collaboration with the New Works Initiative through the Playwrights Lab at Hollins University. I have also had a few of my ten-minute plays performed in Los Angeles and Manhattan as well. How many times has To the New Girl been performed, and how did Studio Roanoke get their hands on it? This play has had one LA production and a workshop production in New York. I think the play was chosen for Studio Roanoke in part because they have always championed new works from new artists, but also because it was originally written to be performed in the same season as Jeff Goode’s The Emancipation of Alabaster McGill which had it’s east coast debut this February at Studio Roanoke. Back in 2010 at SkyPilot Theatre in Los Angeles, where both Jeff and I are Playwrights-inResidence, “Alabaster” had already been chosen for an already male-heavy season of shows. Jeff Goode and Bob Rusch, our Artistic Director, approached the women playwrights in the company and asked us to each write a play that could solve the gender parity problem that faced the 2011 season. I was already inspired to write the show, so I quickly finished the script and turned it in. It was chosen soon thereafter and served to create a more balanced, equal season that featured the talents of our actors of both genders. How long did it take you to write this play? It took me about two months to write the first draft, but then it had several readings, two productions and about a thousand rewrites to get to the draft we’re working with today. Honestly though, I’m never really done with a script. Until someone tells me to stop, I’ll probably always be making minor cuts, edits, and rewrites. What is the main source of inspiration for your plays? Cliché though it is, “The Triumph of the Human Spirit” is probably my biggest inspiration. It covers everything from Love to War (two topics I write about often), and also allows me to create wellrounded, interesting characters for actors to play. I also tend to write a lot about women, in part because of personal experience, but also because I love to see strong female characters represented in the arts, especially in theater. Was there a single event or idea that inspired To the New Girl? I plead the fifth. Is To the New Girl family friendly? I would not suggest bringing the little ones along. I have written plays for younger audiences, this ain’t one of them! TRENT AFTER introducing himself, Chad opened his black carrying case to reveal a colorful display of his work. Inside were glass marbles and pendants containing tiny galaxies of twisting colors and shapes, some enveloping small pieces of opal. into art and I’m trying to educate her on why art costs what it does. Some of these probably only have about $5 worth of glass in them, but I have [put in] two hours worth of work. Somebody asked me once at a show, “How long does it take you to do something like this?” I said, “Well, it takes about two hours and eight years,” because I’ve been working for eight years to get to this point.” If you are interested in seeing more of Chad’s work, you can find it at Gallery 108 in Downtown Roanoke, A Little Bit Hippy at Towers Mall, and The Little Gallery at Smith Mountain Lake in Moneta. Amanda Agricola in her studio space (left); C. Mehrl Bennett giving a Fluxus performance, photo by tsubasa berg (top); Rezzie and Bryan Kurkimilis with projections by Saturn Sheets, photo by Amanda (bottom). Decomposition of QR CODE by Amanda Agricola and Mateo Marquez, photo by Amanda (top); Olchar Lindsann performing Somasemia: Poems Wearing Meat-Suits, photo by tsubasa berg (bottom); Mateo Marquez in his studo space (right). “The main thing we want to do is have a nice space to offer for anybody to use. We want to have weekly shows here,” Mateo explained, adding that other shows they’ve had in the past have included various types of artwork and live music. “We can use this space to host parties. Bring your artwork and hang it on the walls. Bring your friends. I honestly don’t like going out to the bars around here but I would like to come to a place like this. You can have some drinks, you can put up art, have nice music... just whatever. Everyone is welcome.” Anyone who is interested in showing an exhibition of their work should contact the duo. As their website says; “If you are in need of a working space, please contact us. Because we are artists too, and we know how hard it is to find a nice working studio, our prices are accessible.” exclamations is located at 206 Market Square in Downtown Roanoke (above 202 Market) and can also be found on Facebook -Emily Sibitzky and online at www.spaceexclamations.com. Want to help support exclamations? Mateo and Amanda will be running a Kickstarter campaign during the month of June to help raise operating funds. Keep an eye on their Facebook page and website for more information. going to do forever. My family wasn’t too supportive, so I ended up doing a lot of it myself. I decided it wasn’t exactly what I thought it was after I was sponsored and moved out to California. There was no future to it; I was trying to get a grip on where it was going. I didn’t think that art was something I was going to do. About 6-7 years ago was when I started doing it seriously. I understood the process by trial and error, just by watching and deciphering other peoples’ work. Juggling a family and this lifestyle I’m trying to achieve has been really hard. But all of a sudden I got laid off a few months ago, which has been the best thing. All of a sudden I had a guy contact me who just told me, “I’m going to manage you.” So now I’m working on the Beastie Boys album, I’m working on a Chung King album. Just this year I’ve had around 12 interviews. I’ve even had people from Germany interview me. How do people know me and I don’t know them? graffiti has been around since the beginning of man. People have been writing on cave walls for thousands of years but it’s just now getting accepted, which is weird. All of a sudden it’s “really cool,” but that’s a good thing for me. Let’s bring the art out of the galleries and out onto the streets where the people are. It’s not like we want to deface and vandalize. A wall to me is more of a disruption to what we see; it’s such a barrier. How many times do you sit and look at a mural and say, “Gosh, I can’t wait to get around this.” You want to just sit there, stare at it, and absorb it. So instead, when a wall is blank, all you have on your mind is to get around it, to go around the corner. [People] look at vandalism as you writing on something. Well, what about the vandalism of tearing up nature and putting a building there? I mean, what is more detrimental to nature than tearing it up and putting something man-made there? A square building that puts pollution into the air to make profit, that’s vandalism to me. Throwing oil into the ocean, that’s vandalism. Who goes to jail for that? But if you tag something you’ll go to jail. It’s crazy. I don’t get that part. born; he had a lack of calcium in his face. They took several of his ribs out and they reconstructed his face. So I’ve grown up looking at distortion my whole life and it’s something I incorporate into my paintings constantly. I guess it’s something I feel comfortable with and has to do with him being my father, with feeling safe. Slanting, obscuring, and distorting images are one of my favorite things to do. I love to stretch and pull and I do this without Photoshop; I just look at a face and I can pull it down and stretch it in my mind. I take what we see as “perfect people” and do that to them because it is still beautiful in a sense, to me; a “beautiful decay” type of thing. I just find beauty in the grotesque sometimes, or what people see as grotesque, but I don’t see it that way. I have a somewhat photographic memory. I’ll look at something and study it and imagine how I could distort it. Then I’ll take this ear that I’ve been studying and incorporate it into something else and it just works. I don’t know why. I guess because we’re all pretty much connected. And I just realized that I do this, in relation to my father, about four months ago. Everything I do is very psychological because I don’t know any other way to do it. I just find that I can convey my messages like that. I’m a perfectionist, but I’m a sloppy perfectionist. I think that’s one reason I do the distortions because there’s no one true way of doing it; as long as everything looks clean it doesn’t have to be in proportion. the physical effort of doing things instead of taking a picture of something, blowing it up big and pasting it on a wall. That is a form of communication, which is just fine, but say somebody grows up learning all of these different instruments, becomes a really good musician and then someone just sits down in front of a computer, with a machine, composes a bunch of music, and makes millions out of it. You know, there’s a difference to that. It’s the blood, sweat, and tears versus the overnight success. I have been experimenting with different mediums. Right now I’m working with charcoal. I used to not like getting messy but now I don’t mind my fingers getting involved and making it organic. Being a part of the paper, feeling and touching it, the face feels much more real and I feel like I’m even more of a part of it with my oils and my fingers as a part of it. It’s really cool. There are different types of paints that I use. There are a ton of different graffiti companies right now making different spray paints. I buy it from Barcelona, Italy, Germany, and Canada. They all make top-quality paints for graffiti artists. People think, “oh, just go to Wal-Mart, buy some [spray paint],” but it’s like every other artist; they like their Winsor and Newton or Grumbacher types of paints, and now graffiti has its own line of paints with an array of colors. It’s incredible, you just get to go nuts over it. Opposite page: (Top) “She had me at first sight,” Spray paint, 2011; (Bottom) “I sock it,” Spray paint, 2010. This page: (Left) Toobz working in his home, 2011, photo by Emily Sibitzky; (Right) “Building my own litte ghost town,” graphite, 2011.
use the same colors of the same tone as the lightest part. I’m using multiple colors but I don’t even know what they are; as long as I see that they’re close to that scale that’s how I come up with my variations of colors. life. Why narrow it down and make them think one way? It’s so much more about me and the subject matter that I’ve chose. I have much more of a connection with the subject matter; it really is exciting. It’s like meeting a new person, especially when you create it. And you really get to know this person, because you created them, and for that one little moment you’re almost like God, because you created this for people to see. There is that one percent of me that is put into the process, the heart, and the image itself. The color choice, perspective, and the balance of everything… that is me. I V Excuse our smallness! We know that our f irst issue is pretty thin… but you have to admit, it was a lot to do between just the two of us! Our goal for future issues is to include more local artists, feature high school students, and include other articles and reviews. We’d also love your input; send us “Letters to the Editors,” comments and suggestions, and even artist or event recommendations. Part of VIA Noke’s mission is to be community driven and we can’t do that without you. to just go for it. And thanks to our bosses for cooperating with scheduling and constant exhaustion. Shawn Quilter, Dave & Marcia Quilter, David & Lisa Sibitzky, Kevin Irwin, John & Nicole Mueller, Zach Ulmer, Michelle Shepherd, Stephen Kissel, Matt O’Malley & Tara Milligan, David Bernal, Dean Browell, & Vintage Living Magazine. Are you participating in an event or show that you think our readers would be interested in? If you know of anything exciting that is happening in the art world, please give us a heads up. We may want to feature an article on that event or group, or figure out some way in which we can help make things happen. You never know who we may have talked to who is looking to get something started but just needs “this one thing.” You may be the one thing they need! Students! Want to be published? Shoot us an email at contact@desiredhypedesign.com with your name and the word “student” as the subject. You can visit us at vianoke.com to f ind out more. Purchasing ad space in VIA Noke Magazine not only helps you to reach a new audience, but also helps support our local arts community! (It’s free to pick up, but not free to print!) We offer competitive pricing and various options for ad sizes. You can view and download our media kit online at desiredhypedesign.com or contact us today at contact@desiredhypedesign.com.